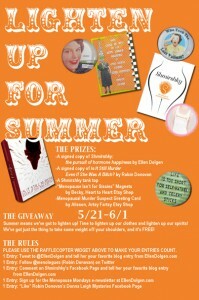 Summer Giveaway or Authors Working Together! One of the best aspects of having your book published is all of the amazing new experiences you have for the first time. The opportunity to meet and partner with other authors in order to promote your book is one of the highlights! I have been lucky enough to have the opportunity and the honor of partnering with Ellen Dolgen of Shmirshky fame. “E” and I have reviewed each other’s books, have shared links and have enjoyed each other’s work – I know I’ve thoroughly enjoyed hers! This summer “E” and I have teamed up with some other of her other contacts for a great summer giveaway! She has worked hard to make a name for herself, and although we are in no way competing for readers (our books compliment each other beautifully – hers is how to deal and mine is how to escape!) I feel extremely fortunate that she has been willing to share her followers with me. 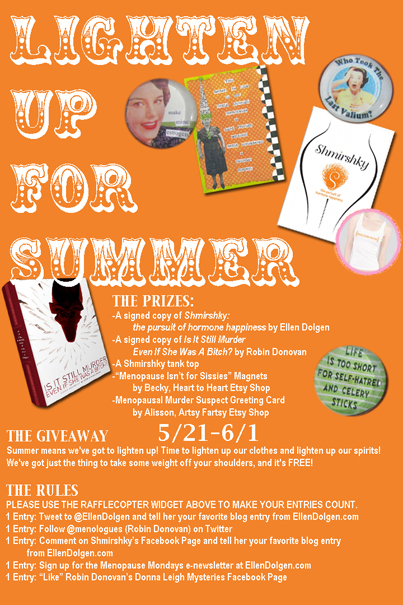 So if you’re interested in breezing through menopause as a hip and cool lady with a great attitude, a great look and a great sense of humor – enjoying life – check out our Summer Giveaway! Who says menopause can’t be fun?